Kate Webster was a rather incompetent career criminal who had served several prison terms for various thefts and offences of dishonesty, both in her native Ireland and in England. These included a period of 12 months in 1877 in London’s Wandsworth prison, where she would ultimately die. 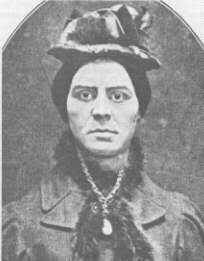 She was born Catherine Lawler in 1849 in Killane, Co. Wexford in what is now the Irish Republic and started her criminal career at an early age. She claimed to have a married a sea captain called Webster by whom, according to her, she had had four children. Whether this is true is doubtful, however. She moved to Liverpool (stealing money for the ferry fare) and continued stealing once she arrived there. This was to earn her a four-year prison sentence at the age of 18. On release, she went to London and took work as a cleaner — often “cleaning out” her employer’s possessions before moving on. In 1873, she settled at Rose Gardens in London’s Hammersmith area. Her next door neighbours were Henry and Ann Porter whom she got on well with and were to feature later in her story. She moved to Notting Hill to a new job as a cook/housekeeper to Captain Woolbest and whilst in his employ, met a man named Strong with whom she went to live and became pregnant by. She duly gave birth to a son on the 19th of April 1874 and was promptly abandoned by Mr. Strong. Without any means of support (there was no Social Security then), Kate resorted to her usual dishonest practices and served several prison sentences as a result. On release from Wandsworth in 1877, she again sought domestic work — firstly with the Mitchell family in Teddington, of whom she was to say that they didn’t have anything worth stealing. She was constantly on the move at this time and used several aliases including Webster and Lawler. Sarah Crease, another domestic servant, became friends with Kate somewhere around this period, and it was Sarah who found herself looking after Kate’s son during his mother’s spells in prison. On the 13th of January 1879, Kate entered the service of Mrs Julia Martha Thomas at No. 2 Vine Cottages, Park Road, Richmond. To begin with, the two women got on well and Kate recorded that she felt she could be happy working for Mrs. Thomas, who was comfortably off, although a rather eccentric woman in her mid 50’s. Soon, however, the poor quality of Kate’s work and her frequent visits to local pubs began to irritate Mrs. Thomas and after various reprimands, she gave Kate notice with Kate’s dismissal to take effect on Friday, the 28th of February. This period of notice was a fatal mistake on the part of Mrs. Thomas and she became increasingly frightened of her employee during its period, so much so that she asked friends from her church and relatives to stay in the house with her. Friday the 28th arrived and as Kate had not managed to find a new job or any accommodation, she pleaded with Mrs. Thomas to be allowed to remain in her house over the weekend. Sadly, Mrs. Thomas agreed to this — a decision that was to cost both women their lives. On the Sunday morning (the 2nd of March 1879), Mrs. Thomas went off to church as usual. Kate was allowed Sunday afternoons off work but had to be back in time for Mrs. Thomas to go to the evening service. This Sunday afternoon Kate went to visit her son, who was as usual in the care of Sarah Crease, and then went to a pub on the way back to Vine Cottages. Thus she got back late which inconvenienced Mrs. Thomas, who again reprimanded her before rushing off so as not be late for the service. Fellow members of the congregation noticed that she seemed agitated, whether this was because she suspected Kate’s dishonesty and feared her home was being robbed, is quite possible. We had an argument which ripened into a quarrel, and in the height of my anger and rage I threw her from the top of the stairs to the ground floor. She had a heavy fall. I felt that she was seriously injured and I became agitated at what had happened, lost all control of myself and to prevent her screaming or getting me into trouble, I caught her by the throat and in the struggle choked her. At her trial, the prosecution painted a rather different picture. Mrs. Thomas’ next door neighbour, Mrs. Ives, heard the noise of the fall followed by silence and at the time thought no more of it. Little was she to suspect what was to happen next. Kate, of course, had the problem of what to do with the body but instead of just leaving it and escaping, she decided to dismember it and then dispose of the parts in the river. She set about this grim task with a will, firstly cutting off the dead woman’s head with a razor and meat saw and then hacking off her limbs. She par-boiled the limbs and torso in a copper on the stove and burned Mrs. Thomas’ organs and intestines. Even Kate was revolted by all this and the enormous amount of blood everywhere. But she stuck to the job and systematically burnt or boiled all of the body parts and then packed the remains into a wooden box, except for the head and one foot for which she could not find room. It has been said that Kate even tried to sell the fatty remains from boiling the body as dripping. Mrs. Ives was later to report a strange smell from next door (which was caused by the burning). Kate disposed of the spare foot on a manure heap but was left with the problem of the head, which she decided to place into a black bag. She continued to clean up the cottage on the Monday and Tuesday and then “borrowing” one of Mrs. Thomas’ silk dresses went to visit the Porter family on the Tuesday afternoon, taking the black bag containing the head with her. She told the Porters that she had benefited under the will of an aunt who had left her a house in Richmond which she wanted to dispose of, together with its contents, as she had decided to return to Ireland. She asked Henry Porter if he knew a property broker (estate agent) who might be able to assist her. Later in the evening Kate excused herself and went off, ostensibly to visit another friend, returning later without the black bag which was never found. Both Henry Porter and his son Robert had carried the bag for Kate at various stages of their walk to the railway station and two pubs along the way and both noticed how heavy it was. This still left Kate with the rest of the human remains in the box to dispose of and she sought the services of young Robert Porter to help her in this, taking the lad back home with her for the purpose. She and Robert carried the box between them to Richmond Bridge, where Kate said she was meeting someone who was taking the box and told Robert to go on without her. Robert was to hear a splash of something heavy hitting the water below a few moments before Kate caught up with him again. The box was discovered the next morning by a coal man who must have had a horrible shock when he opened it. He reported his discovery to Inspector Harber at Barnes police station and the police had the various body parts examined by a local doctor who declared that they were from a human female and noticed that the skin showed signs of having been boiled. Without the head, however, it was not possible to identify the body. Kate meanwhile was calling herself Mrs. Thomas and wearing the dead woman’s clothes and jewellery. She kept up pressure on Henry Porter to help her dispose of the property and he introduced her to a Mr. John Church, who was a publican and general dealer, who she persuaded to buy the contents of the house. Kate and Church seemed to rapidly become friends and went drinking together several times. The real Mrs. Thomas had not been reported missing at this stage and the papers referred to the human remains in the box as “the Barnes Mystery,” a fact known to Kate as she could read, as could the Porter family. Robert told his father about the box he had helped Kate carry which was like the one described in the papers. Kate agreed a price for the furniture and some of Mrs. Thomas’ clothes with John Church and he arranged for their removal. Unsurprisingly, this was to arouse the suspicion of Mrs. Ives next door who questioned Kate as to what was going on. Mrs. Church was later to find a purse and diary belonging to Mrs. Thomas in one of the dresses. There was also a letter from a Mr. Menhennick to whom Henry Porter and John Church paid a visit. Menhennick knew the real Mrs. Thomas and it became clear from the discussion that it could well be her body in the box. The three men, together with Menhennick’s solicitor, went to the Richmond police station and reported their suspicions. The next day a search was made of No. 2 Vine Cottages and an axe, razor and some charred bones were recovered, together with the missing handle from the box found in the river. Thus on the 23rd of March, a full description of Kate Webster was circulated by the police in connection with the murder of Mrs. Thomas and the theft of her effects. Kate had decided to flee to Ireland taking her son with her — which was to be the first place the police looked for her. She was arrested on the 28th of March and kept in custody awaiting collection by two detectives from Scotland Yard. She was brought back to England and taken to Richmond police station where she made a statement on March 30th and was formally charged with the murder. The statement accused John Church of being responsible for Mrs. Thomas’ death and he was subsequently arrested and charged with the murder too. Fortunately, he had a strong alibi and had also assisted the police in discovering the crimes. At the committal hearing, the charges against him were dropped while Kate was remanded in custody. She was transferred to Newgate prison to save the journey by horse drawn prison van across London each day for her trial. Kate Webster’s trial opened on the 2nd of July 1879 before Mr. Justice Denman at the Central Criminal Court (the Old Bailey) next door to Newgate. In view of the seriousness of the crime, the Crown was led by the Solicitor General, Sir Hardinge Giffard, and Kate was defended by Mr. Warner Sleigh. A hat maker named Mary Durden gave evidence for the prosecution telling the court that on the 25th of February, Kate had told her she was going to Birmingham to take control of the property, jewellery, etc. that had been left her by a recently deceased aunt. This, the prosecution claimed, was clear evidence of premeditation, as the conversation had occurred 6 days before the murder. One of the problems of the prosecution case, however, was proving that the human remains the police had found were actually those of Mrs. Thomas. It was a weakness that her defence sought to capitalise on, especially as without the head there was no means of positively identifying them at that time. Medical evidence was given to show that all the body parts had belonged to the same person and that they were from a woman in her fifties. The defence tried to suggest that Mrs. Thomas could have died of natural causes, in view of her agitated state, when she was last seen alive leaving church on the Sunday afternoon. Both Henry Porter and John Church gave evidence against Kate describing the events of which they had been involved, and her defence again tried to point the finger of suspicion at them. In his summing up, the judge, however, pointed to the actions and previously known good characters of both of them. Two of Kate’s friends, Sarah Crease and Lucy Loder, gave evidence of her good nature. Late on the afternoon of Tuesday, the 8th of July, the jury retired to consider their verdict, returning just over an hour later to pronounce her guilty. Before she was sentenced, Kate yet again made a complete denial of the charge but cleared Church and Porter of any involvement in the crime. As was normal, she was asked if she had anything to say before she was sentenced and claimed to be pregnant. She was examined by a panel of matrons drawn from some of the women present in the court and this claim was dismissed as just another of her lies. She went back to Newgate and was transferred the next day to Wandsworth to await execution. It has been suggested that Wandsworth did not have a condemned cell at this time although it would seem unlikely. In any event, Kate was guarded round the clock by teams of female prison officers. Kate was to make two further “confessions” in Wandsworth, the first implicating Strong, who was the father of her child. These allegations were also found to be baseless. Kate was informed by her solicitor that no reprieve was to be granted to her, despite a small amount of public agitation for commutation. So on the eve of her hanging, Kate made another confession to the solicitor in the presence of the Catholic priest attending her, Father McEnrey, which seemed somewhat nearer the truth. She stated that she was resigned to her fate and that she would almost rather be executed than return to a life of misery and deception. The actual execution of the sentence of death had changed a great deal over the 11 years between the ending of public hangings and Kate’s death, even though the words of the sentence had not. No longer was it a public spectacle with the prisoner being given a short drop and allowed to die in agony. 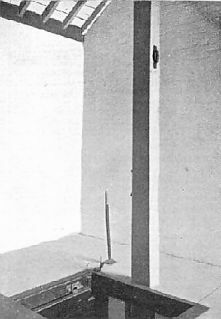 William Marwood had made great improvements to the process and had introduced the “long drop” method, designed to break the person’s neck and cause instant unconsciousness. The execution was, as usual, to take place three clear Sundays after sentence and was set for the morning of Tuesday, the 29th of July at Wandsworth prison. Wandsworth was originally the Surrey House of Correction and had been built in 1851. It took over the responsibility for housing Surrey’s condemned prisoners on the closure of Horsemonger Lane Gaol in 1878. Kate was to be only the second person and the sole woman to be hanged there. At 8.45 a.m., the prison bell started to toll and a few minutes before 9.00 a.m. the Under Sheriff, the prison governor, Captain Colville, the prison doctor, two male warders and Marwood formed up outside her cell. Having the gallows in a separate building spared the other prisoners from the sound of the trap falling, and made it easier too for the staff to deal with the execution and removal of the body afterwards. As Kate entered the shed, she would have been able to see the large white painted gallows with the rope dangling in front of her with its simple noose laying on the trapdoors. The idea of coiling up the rope to bring the noose to chest level came later, as did the brass eyelet in the noose. Marwood stopped her on the chalk mark on the double trapdoors and placed a leather body belt round her waist to which he secured her wrists, while one of the warders strapped her ankles with a leather strap. She was not pinioned in her cell, as became the normal practice later. He quickly stepped to the side and pulled the lever, Kate plummeting down some 8 feet into the brick-lined pit below. Marwood used significantly longer drops than later were found to be necessary. Kate’s body was left to hang for the usual hour before being taken down and prepared for burial. The whole process would have taken around two minutes in those days and was considered vastly more humane than Calcraft’s executions. The black flag was hoisted on the flag pole above the main gate, where a small crowd of people had gathered for her execution. They would have seen and heard nothing and yet these rather pointless gatherings continued outside prisons during executions until abolition. The Sheriff’s Cravings show that William Marwood received £11 for hanging Kate, presumably £10 plus £1 expenses. Later in the day, her body was buried in an unmarked grave in one of the exercise yards at Wandsworth. ** She is listed in the handwritten prison records as Catherine Webster, interred 29/07/1879. 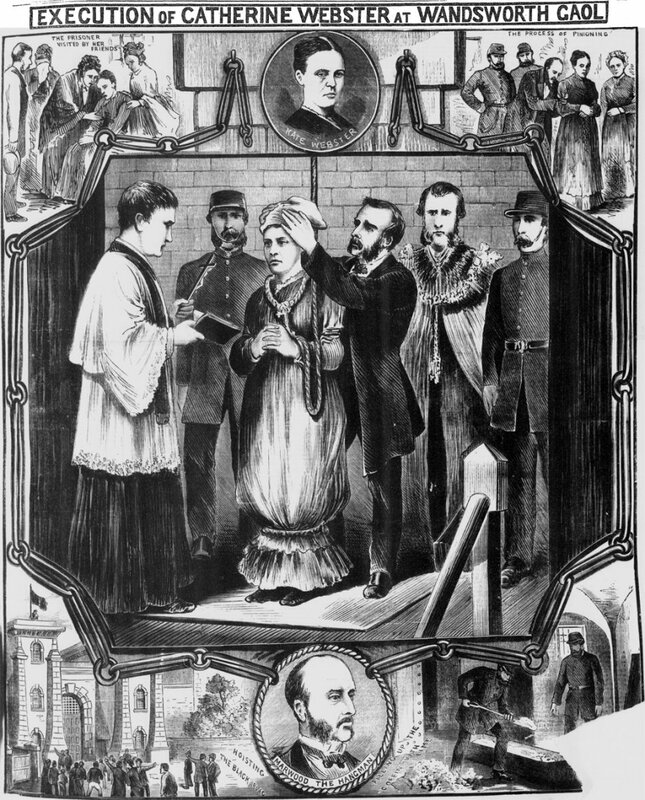 Although she was the second person to be executed at Wandsworth, she was buried in grave no. 3 as the graves were numbered 1, 3, 5, etc. on one side of the path, while on the other side they were numbered 2, 4, 6, etc. and it was decided to use those on one side first. In all, 134 men and Kate were to be hanged at Wandsworth up till the 8th of September, 1961, when Henryk Niemasz became the last to suffer for the murder of Mr. and Mrs. Buxton. If the events of that Sunday evening were exactly as Kate described them, it is strange that Mrs. Ives did not hear the quarrel or any other noises from next door. Again why were there bloodstains at the top of the stairs if Mrs. Thomas’ injuries had occurred at the bottom? It is generally held that Kate lay in wait for Mrs. Thomas and hit her on the head with an axe causing her to fall down the stairs, where she then strangled her to prevent any further noise. This would, of course, make the crime one of premeditated murder and is much more in line with the forensic evidence. Whether Kate decided to kill Mrs. Thomas in revenge for her earlier telling off or whether it was because she saw a great opportunity to steal from Vine Cottage, or both, is unclear. It is not unknown for previously non-violent criminals to turn to violent murder. John Martin Scripps became, to date, the last British man to be hanged for murder when he was executed in Singapore in April 1996. He too had convictions for dishonesty. But what turned Kate to such appalling violence? Did she just snap or had she spent two hours or so thinking about it? We will never know the answer to these questions because there was no psychiatric assessment carried out on murderers back then. It was reported in October 2010 that Julia Martha Thomas’s skull has finally been discovered in the grounds of Sir David Attenborough‘s property in Park Road, Richmond by workmen excavating for an extension. He had purchased a former pub called “The Hole in the Wall” which was adjacent to his property and has had demolished the rear of the pub. It is highly likely that Kate Webster frequented “The Hole in the Wall”. The coroners report stated that the skull had fractures consistent with falling down stairs and also had depleted collagen which suggested it had been boiled. * Interesting sidelight on the popular circulation of crime news here, using a comparison of this case and that of another noteworthy 1879 hanging, Charles Peace. -ed. ** After the 90th Wandsworth execution, the authorities started to re-use some graves of previously hanged male prisoners. Nobody else was ever buried in Kate’s grave, however. Useful data. Hope to see more good posts in the future.